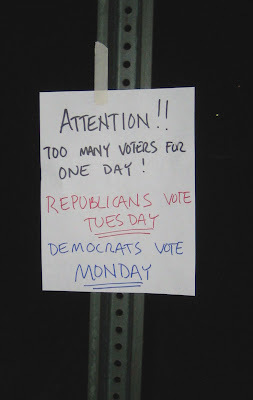 Mr. R reported that his next door neighbor, Mr. C (not his real name) heard about a subversive act in other cities to trick Democrats into voting on the wrong day. They decided to try it and in Mr. C’s words, “It worked like a charm!” The two posted signs all over the neighborhood stating that there were too many people voting and that the voting would be split up over two days. We found hundreds of these signs over the Columbus area.